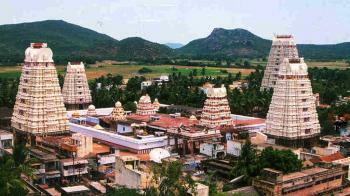 In the State of Tamil Nadu there are many places to visit. Nilgiri Hills are one of them. This place is famous for Scenic and Hill station. The altitude of this place is 2637 mt. Tamil and English languages are used in this place. Nilgiri Hills are most attractive destination of Tamil Nadu. It is blessed with rich flora and fauna. Different species of Flora and Fauna's are found in this place. Over 2700 species of flowering plants, 160 species of ferns, numerous types of flowerless plants, algae, fungi, mosses and land lichens are found in the Nilgiri. There are many places in and near the Nilgiri Hills. The Weather in Nilgiri is Tropical type i.e. Hot in summers, moderately cool in winters. The Nilgiri Hills are part of the Nilgiri Biosphere Reserve. 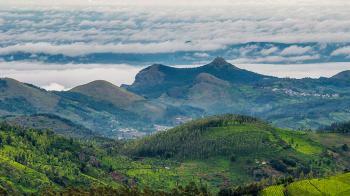 Nilgiris derives its charm from its natural setting. Nilgiri is the best tourist spot and best place of Nature Lover. There are many attractions of Nilgiri Hills. Most famous and important attractions are : Magnificent hills Fantastic valleys Brilliant waterfalls Nilgiri Hills are also known as Blue Mountains in India. 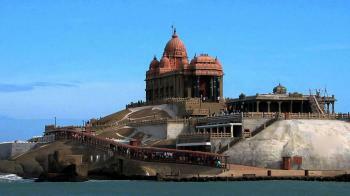 Kanyakumari, formly known as cape comorin, is a town in the state of Tamil Nadu, India. 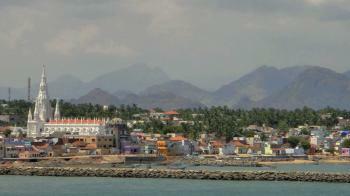 It is also pronounced as Kanniyakumari. It is surrounded by the hills and the plains bordered by the colorful sea-shores with coconut trees, covering an area of 1672 sq.km and is at the southernmost tip of peninsular India, of Cardamom Hills. The name comes from the Devi Kanya Kumari Temple in region. It is a most popular tourist destination during the Sangam Period. Annamalai/ Indira Gandhi Wildlife Sanctuary is a beautiful place situated in the Coimbatore district of the state of Tamil Nadu. 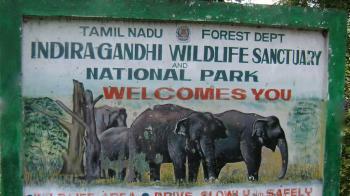 Indira Gandhi National Park is the part of the sanctuary and is also known as the Annamalai Wildlife Sanctuary. The word Annamalai derives from two word : Anna means "Elephant" and Malai means "Hills" as large number of wild elephants lives here. Ooty is a town and a headquators of Nilgiri District, located on western ghats zone at an elevation of 7349 ft in the Indian state of Tamil Nadu where two mountains ranges meet. Ooty is popular hill stations and is known as " Queen of Hill Stations ". Ooty is also called by Udhagamandalam. 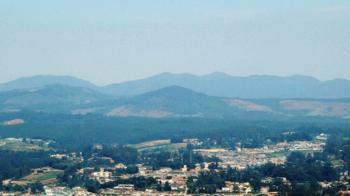 Ooty was occupied by Toda, and later the area came under the rule of East India Company in 18th century end. It is a popular summer destination as it natural beauty atrracts tourists. Mudumalai Wild Life Sanctuary is one of the famous National Park situated between the tri-junction of Tamil Nadu, Kerala, Karnataka at elevation of 1000 meters and lies on the Northwestern-Northeastern slopes of Nilgiri Hills, in Nilgiri district about 150 km in north-west of Coimbatore city, in Kongu Nadu region of Tamil Nadu. 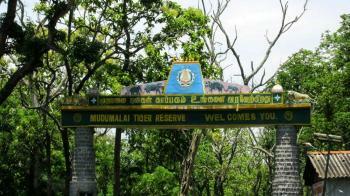 Mudumalai National Park covers the area of about 321 sq. mts.. It is consider as the one of the best Wildlife Sanctuaries of India. This Sanctuary is provided with Deep Valleys, Waterfalls, Rivers, Wooded Hills, Marshes, Plateau by the Nature. The Mudumalai National Park forms the single region with the Badipur Tiger Reserve in the North and Wynad Wildlife Sanctuary in the west. The area of Mudumalai National Park ranges similar to the Badiput Tiger Reserve but the Mudumalai National Park has Moya River in it which adds beauty to the National Park. This National Park is home to several Endangered and Vulnerable species including Gaur, Bengal Tiger, Indian Elephant and Indian Leopard. About 266 species of Birds including Long - Billed Vulture and critical endangered Indian white rumped Vulture are in the Sanctuary. The climate is very warm as it is surrounded by thick forest and streams. This National Park is under consideration by the UNESCO World Heritage Committe. In the state of Tamil Nadu, there is a town located in Pamban Island known as Rameswaram. Rameswaram means "Lord of Rama". At the very tip of Indian Pennisula, Rameswaram is located in Gulf of Mannar. Pamban Island is also known as Rameswaram Island. It is a holiest place in India and the part of Char Dham pilgrimage. From Rameswaram, God Rama built a Bridge to Sri Lanka to rescue Mata Sita from Ravana and it is the closest point to reach Sri Lanka from India. Rama Sethu is the former of land connection betwwen India and Sri Lanka. This Temple is dedicated to Lord Shiva. From the 12 jyotirlinga of Lord Shiva in India Rameswaram jyotirlinga repesent the southernmost. The second largest rail bridge of India is Pamban rail bridge and is also known as Queen of Indian bridges.